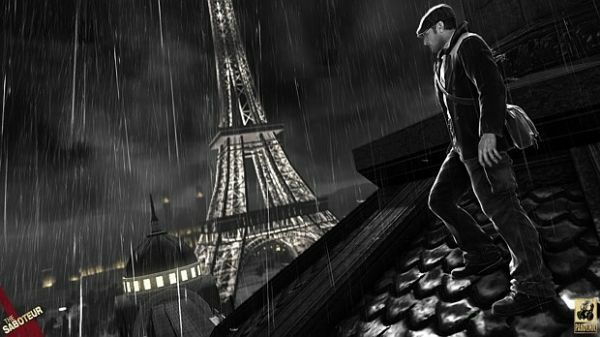 The Saboteur is a single player action game set in World War 2 era France following the exploits of Sean Devlin, a "saboteur" fighting the Nazi's using his own espionage tricks. As Sean, you're an amazing Nazi hunting hero with refilling health system, unique artistic game design, and a sweet hat. Play through, in, and above buildings in Paris weeding out the Nazi threat using whatever means necessary. The first thing that stands about about The Saboteur is the artistic design of the game. Instead of the bright city lights of France, we get a France noir that has been occupied by Nazis. Only, it's not just black and white or sepia noir - we get an intense display of cleverly used color. Mostly red. The dynamic nav point system in The Saboteur allows player to run around as Sean shooting Nazis, being shot at, and waging this secret war. You explore areas in every direction possible, and use the clever color system to find where you need to go next - Follow the red lights, or illuminated ladder, or the Nazi who's arm band stands out a dangerously bright red. There is also a cover system that puts Sean into hiding whenever you get close to cover, allowing Sean's health to reset. The developers wanted the game to let players game, not micromanage their health bar - with all the climbing, running, and hiding there would have to be health on every square of the games grid. You'll pick up enemies weapons, as well as grenades and other handy tools for sabotage. Nazi's are merciless, and so should you be.